Upon arrival, please check in with Station One to get signed in! Make sure you have printed and completed out your Waiver Form in advance. Visit Dance Studio Pro to view your weekly class schedule. Make sure to know your class schedule prior to arriving to the studio. There will be posts on the walls all over the place indicating which classes are in their respective studios. 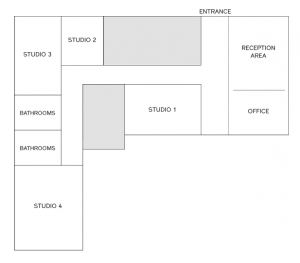 Here is a Studio Map! We want to make sure that the classroom setting is distraction free, and comforting for the kids, so we ask for parents to watch the class from the outside viewing windows, and the live stream TV screens in the lobby. If your child is 6 years and under, and does not feel comfortable coming into the classroom alone, we will allow you to accompany your child until they feel ready to independently come into the classroom. Please refer to the Dress Code Here. Do I Have To Stay At The Studio While My Child Is In Class? No, you are welcome to leave the studio and come back when your childs class ends. What If I Want To Change or Add A Class?